Plans to introduce US-style Olympic trials to Team GB selection have been met with a mixed response. United States Olympians win their places through one-off races against their domestic rivals rather than rely on previous success at major events. The British Olympic Association (BOA), which runs Team GB, said talks are in their "very early stages". The idea would not come in until 2020 at the earliest, with some sports welcoming the chance to boost revenues. "There is a shared belief that Olympic trials events, such as those seen in the US, have the potential to be successful in the UK, helping to sustain the profile and public interest in Olympic sport," said a joint statement issued by the BOA and UK Sport, the agency that allocates lottery and public funding to Olympic and Paralympic sports. Some sports have already dismissed the idea but athletics and swimming, the two sports that usually send the most athletes to the Games, are keen to keep talking about the feasibility of the proposals. Both, however, already have their own televised trials, as well as lucrative sponsorship deals that do not always complement the BOA's. The BOA has denied it wants to bring in the "first-past-the-post" trials that generate so much drama - and therefore interest - in the US. 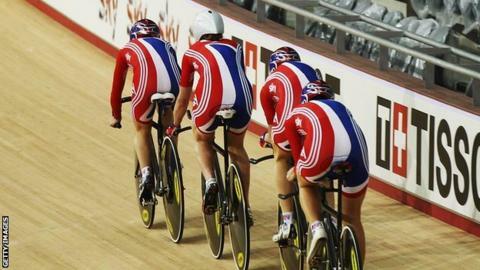 "A trials format wouldn't work for cycling," said British Cycling boss Ian Drake. He outlined concerns over the already complicated process of qualifying riders for the Games and the crowded calendar. "As the national governing body, we're responsible for our riders' ability to produce inspirational performances against the world's best and on the biggest stages," he added. Jason Kenny (left) was selected ahead of 2008 gold medallist Sir Chris Hoy (right) for the men's individual sprint at London 2012. Kenny went on to beat Gregory Bauge and win gold. "A key part of the success British Cycling has achieved over the last four Olympic cycles has been the way our performance staff have prepared and selected riders. "So we know holding trials means potentially asking our team to peak numerous times within a short space of time - to qualify places, for the trials and then for the Olympics - and puts medal-winning performances at risk." It is a stance shared by several other governing bodies that the BBC has spoken to in recent weeks, including GB Boxing. "The qualification process is long and complicated and it is very difficult to see how an event of this nature could be fitted into what is already a very demanding schedule," a GB Boxing spokesman said. There is support for the BOA idea from some quarters. A senior figure from British Rowing told the BBC the organisation liked the concept, providing some leeway on selection could be reserved for its coaches. Rowing is currently holding its Olympics trials effectively in private. But the challenge will be to marry the wish for more publicity - and satisfy any potential broadcasters' demands for drama - with the sports' primary purpose of arriving at the Olympics in the best shape to win medals. High-profile examples of the American trials system include defending champion Carl Lewis failing to qualify for the 100m at the Barcelona Olympics while Allyson Felix needed team-mate Jeneba Tarmoh to give her America's third 100m slot at London 2012.